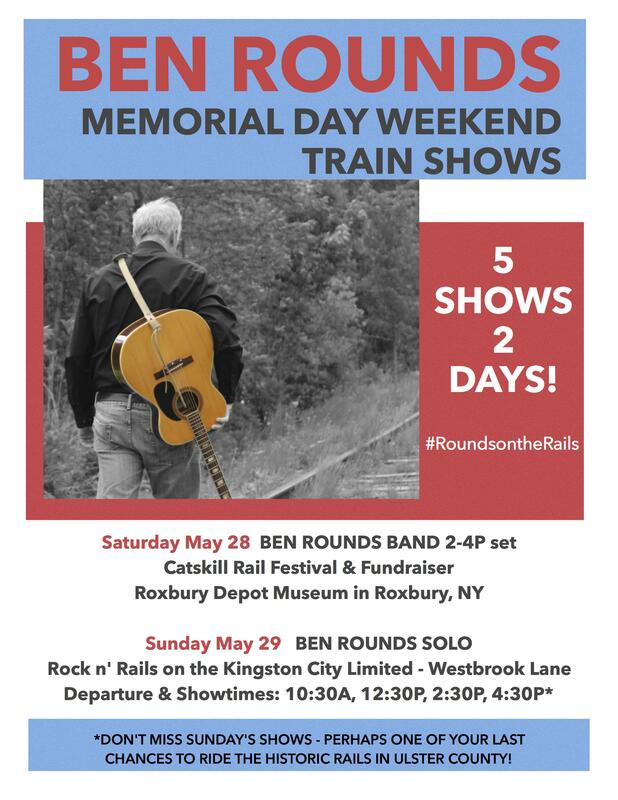 Home>Events>Five train shows this Memorial Day weekend – Ben Rounds & the B.R.B. Five train shows this Memorial Day weekend – Ben Rounds & the B.R.B. Local musician and ‘Save The Rails’ activist Ben Rounds has a 5 show , 2 County line-up this Memorial Day Weekend. #RoundsontheRails for all the details! Saturday May 28: 2-4 pm Rounds On The Rails Pt. 1 at the Catskill Rail Festival & Fundraiser Event @ Roxbury Depot Museum in Roxbury, NY. This is a Ben Rounds BAND show. Wednesday, June 8, 6:30-7:30 pm Ten Broeck Commons Country BAND Show. Ben does not advertise all shows, some are private bookings. Please refer back to this page as July and August shows will post at the end of June. Dates booked for private shows: June 11, 22 & 27. At age 15, Ben started his career in music, joining his 1st garage band. As a weekend warrior, he was the lead guitar/vocal in many bands over the years, including The Famous Lees of Krumville, Thunder Ridge and the Ben Rounds Band. In 2011, Ben started living the dream as a successful full-time working musician. In January of 2014, Ben began his solo career, averaging at least 15 public and private shows a month. Eight months later, he released his long awaited debut album, self-titled “Ben Rounds”. CHECK OUT Ben’s Latest Videos Here. Photographer, writer and promoter of local music.